These ribs rock. 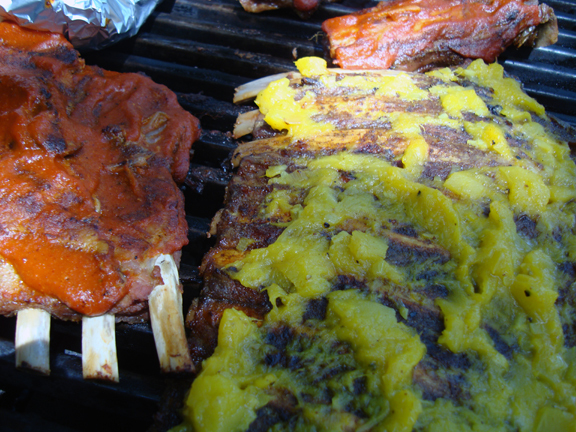 The spice rub pairs well with a homemade barbecue sauce or with the Indian mango sauce. The key is to cook them low and slow. Be patient, you will be rewarded. If you can, finish your ribs on the grill. Combine all the spices together. Rub on all sides of the ribs. Place the ribs in a roasting pan and pour some beer and/or water into the pan. Tightly seal the pan with foil and cook at 200 degrees for about four hours. If you are cooking them on the grill, wrap them in foil and cook them over indirect heat for about 1 1/2 hours. Either way, finish them over direct heat on the grill for 10 minutes, brushing with either homemade barbecue sauce or the mango sauce, recipe follows. Heat the coconut oil in a saucepan and add the shallots. Cook over medium heat for several minutes, until the soften. Reduce the heat and add the curry powder, pepper, ginger, garlic. Saute for a minute or so to release the flavors, but be careful to not burn the garlic. Add the mango chunks and continue to heat until the mango softens and you can mush it easily, about 15 minutes. Puree in a food processor, if desired. Brush onto ribs just before serving, and serve on the side with the ribs.